Jehovah's Witnesses - new information - support groups - Bible answers: "COMMENTS FROM THE FRIENDS"
Why does the Governing Body deny the existence of these pictures? Each issue of THE WATCHTOWER is later reprinted in a bound volume at the end of the year. But the issue of September 15, 1982 was reprinted with a different cover picture. (Foreign editions printed after the U.S. English edition also featured the new cover.) Why? 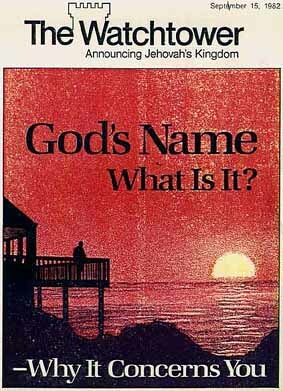 What made the Watchtower Society stop using the original red sunset porch silhouette and replace it with a scene of trees and mountains? The answer is so shocking to Jehovah's Witnesses that the Society is trying to cover it up. 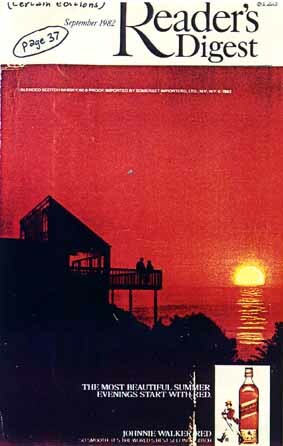 Since the middle of 1981 the red sunset porch silhouette liquor ad appeared in several major U.S. magazines. 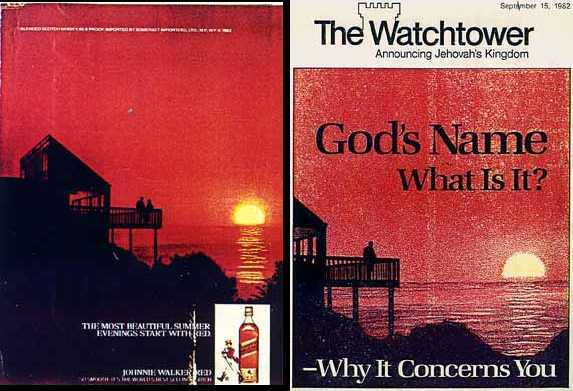 Then THE WATCHTOWER's issue of September 15, 1982, was published with the same picture (slightly modified) on its cover. When questioned, official Watchtower spokesmen at first claimed their artist had drawn the same picture simply "by coincidence." However, Comments from the Friends, in its October, 1982, issue, publicly exposed what THE WATCHTOWER had done. Ex-JW's also ran newspaper ads, made phone calls, wrote letters, etc., making known the source of THE WATCHTOWER's cover picture. In the midst of such publicity the liquor company found out what had happened. Not about to swallow the "coincidence" story, they had their legal staff contact the Watchtower Society. Caught red-handed with the liquor company's picture on its cover, and eager to avoid further embarrassment, the Watchtower Society agreed to an out-of-court settlement. Obviously included in this was the provision that they stop using the liquor company's picture in their publications. But the Watchtower Society is still trying to cover up the facts. Persons asking why the bound volume reprint has a different cover picture are receiving answers such as the Society's letter shown here claiming that the cover was changed to "produce a more appropriate and suitable illustration." Why is the Watchtower Society determined to hide the truth regarding its September 15, 1982, cover? Because this information exposes THE WATCHTOWER for what it really is--not "the channel of comunication" from God, as it claims, but just another magazine like the magazines it 'borrowed' the picture from. A little investigation reveals that 'borrowing' the liquor company's picture is by no means the first scandal at Watchtower headquarters. Nor is it the first time The Watchtower has changed its mind about its pictures, its prophetic dates, its doctrines, etc. For example, when THE WATCHTOWER's prophecy that the world would end in 1914 proved false, the date was changed to 1918. Then to 1925, etc. Later, to 1975. And now [as of this 1983 writing] the Watchtower Society predicts that the world will end "before the generation that saw the events of 1914 passes away." " . . . forever changing our minds about what we believe because someone has told us something different, or has cleverly lied to us and made the lie sound like the truth." If you are one of Jehovah's Witnesses, and now realize that the Watchtower Society's claim to be "the channel of communications from God is false, you owe it to yourself to identify the true channel. God's channel is not another organization publishing a magazine, but is the "one mediator between God and men," Jesus Christ. WATCHTOWER REVERSES ITSELF on policy that sent JWs to prison for years. A "new truth" in the May 1, 1996 WATCHTOWER magazine allows Jehovah's Witnesses to accept civilian 'alternative service' as conscientious objectors to the military draft. Prior to this time draftees who reported to civilian hospitals for such noncombatant work faced the punishment of being shunned by family and friends as "disassociated persons." In order to be accepted as faithful JWs, young men had to insist on total exemption as "ministers"--or, if this exemption was not granted, they had to go to prison as draft refusers. This policy resulted in the imprisonment of thousands of 'faithful' Witness boys in recent decades, and in the enforced shunning of many others. Ironically, a majority of the JW Governing Body at Brooklyn headquarters had been voting to abandon that policy ever since 1978, but not the two-thirds majority required to enact such a "new truth." (See pages 101-102 of the book Crisis of Conscience by former Governing Body member Raymond Franz.) The required two-thirds majority vote must now have finally taken place, allowing the May 1, 1996 issue of THE WATCHTOWER to announce its "new truth." In the meantime, for nearly 18 years, JW young men have been going to prison to comply with the old policy that even most of the sect's Governing Body members did not believe in. More information on this and other new developments in Watchtower teaching appears in the Summer issue of COMMENTS FROM THE FRIENDS. Crisis of Conscience by Raymond Franz--the former Governing Body member's book that reveals the inner workings of the headquarters organization. Jehovah's Witnesses and the Hour of Darkness by Darek Barefoot--the book that exposes the hidden faces and occult symbols in Watchtower illustrations and the high-level cover-up behind their continued appearance. "No blood!" by David A. Reed--the fast-moving novel revealing what happens when a boy needs a transfusion to stay alive and his parents sincerely believe the Watchtower Society speaks for God.